Looking for mouth watering ribs that don’t take all day long to cook? Res-Q-N BBQ to the rescue! The concept was new to us here at the office, but one sample and we were hooked. Award-winning BBQ master, Melvin Boese, creates delicious meaty ribs that you just heat-n-eat. Smoked, sauced and sealed in a cryovac bag, all you do is boil in a pot of water! No more waiting on your smoker all day long. Melvin has perfected his product and was ready to go beyond just the farmers market. We transitioned his logo design and colors to an all new mobile friendly website. Using calls to action buttons directs customers to complete the straightforward order forms. His customers can now order online or arrange for local pick-up. 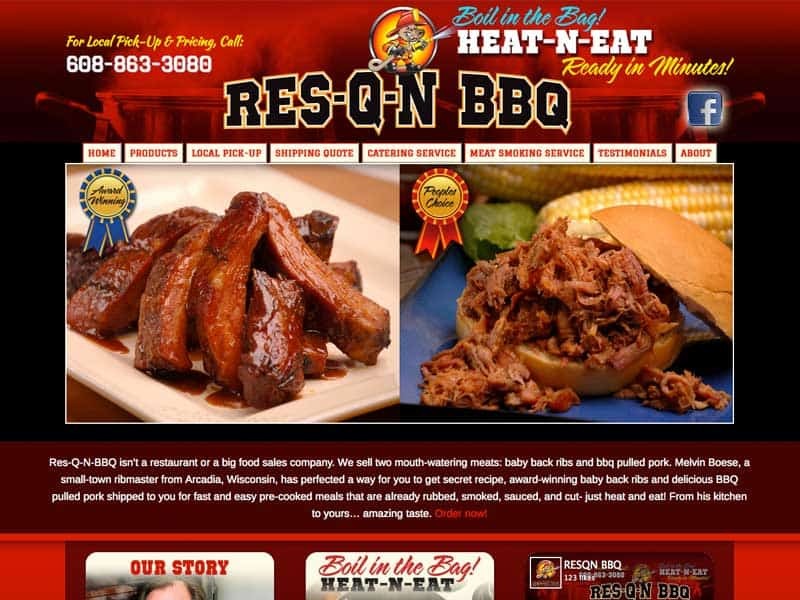 Res-Q-N BBQ specializes in 2 products and we made them prominent by working with a excellent food photographer. Learn more about how Vision Design can help you with web marketing. Contact Us today!